We are so lucky to be only 20 minutes from Ludlow. Featured in the Guardians’ top 10 small towns for great weekend breaks and famed for having more Michelin stars than anywhere outside London. 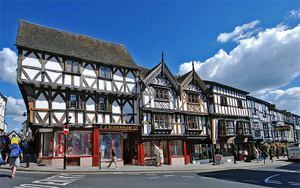 Ludlow is foodie heaven and described by Country Life as “the most vibrant small town in the Country”. It has over 500 listed buildings, mainly Georgian or half-timbered – it is a pleasure to amble through the streets and check out all the speciality shops and independent boutiques. 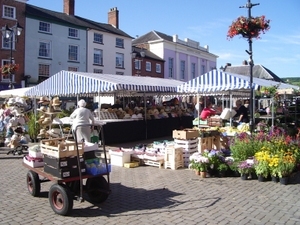 Ludlow has a great market right in the heart of the town just outside Ludlow Castle. There is always something going on and festivals are held throughout the year celebrating the best produce in the region. Broad Street is one of the country’s finest streets, with the elegant Buttercross building at the top and a medieval town gate at the bottom. Check out the stunning architecture of the Feathers Hotel (pictured below) on the Bull Ring or take afternoon tea in De Grey’s a quintessential English Tea Room (on Broad Street which is pictured right) – it’s like stepping back in time. And that’s partly what makes Ludlow and Shropshire so special – it’s a little old fashioned, the pace of life is slower and everyone has time to say hello. Shropshire is a great place to relax and get away from the stress of modern life. If you stay with us at the Baron then enjoy a tasty Shropshire Breakfast with bacon, sausage and black pudding from outstanding Ludlow butcher Andrew Francis who’s right on the corner of the market square in Ludlow – this will set you up for the day! 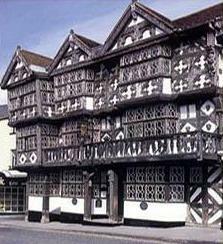 Ludlow hosts a number of festivals and fairs each year many celebrating our fine local produce. After another successful Ludlow Food Festival last year (despite the weather!) the Ludlow Food Festival dates for this year are 13th-15th September. Showcasing the best food and drink from across the region of Ludlow and the Marches. It’s a foodies heaven with everything from perry to puddings, meat to mead and everything in-between. There are over 160 Exhibitors, free talks and demos, kids activities, trails and much more. If you want to visit the Food Festival why not book a weekend at the Baron, but be quick as we are always busy that weekend. Remember we are only 20 minutes from Ludlow and you can take advantage of the park and ride or take the bus into Ludlow and enjoy the journey through gorgeous Shropshire countryside. Also not to be missed is Ludlow Castle, the finest of medieval ruined castles is at the heart of this superb, bustling black & white market town and is the centre of the fantastic festivals. Once the home of Kings, Ludlow Castle has been described as “the epitome of what a castle ought to be” – the castle dominated life in Ludlow for centuries. The Castle originally a Norman Fortress to hold back unconquered Welsh and extended over the centuries to become a fortified Royal Palace, has ensured Ludlow’s place in English history. Since 1811 the castle has been owned by the Earls of Powis, who have allowed this magnificent historical monument to be open to the public. 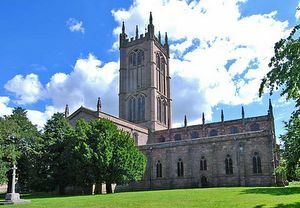 Take a look at St. Laurence’s Church. The ashes of A. E. Housman, the celebrated poet and author of “A Shropshire Lad” are buried in the church grounds, with the stump of a cherry tree marking their location. There’s some lovely architecture and the view from the top of the tower is well worth the effort! Ludlow Brewery and Visitors Centre is next to the train station. Pop in and see how real ale is made while enjoying a sample (or two). Ludlow Food Centre, whish is just outside Ludlow on the main A49 heading towards Shrewsbury, has a lovely range of local produce, much of it sourced from the Earl of Plymouth’s Oakly Park Estate. 80% of the food sold comes from the local area and 50% is actually made in the units surrounding the food hall which is visible from the shopping area. When you return to the Baron, exhausted after such a full day, have a nap on the 2000 pocket sprung English bed to power up for a delicious meal and try some real ale – we regularly have Ludlow and Wye Valley bitter, or try a Robinson’s traditional craft cider, or have a wee dram of Welsh Whisky while chatting to the locals. That’s your evening sorted!